The Canadian Centre for Policy Alternatives claims Progress Energy built dams without proper permits. But the company contends it did nothing wrong, saying the CCPA report is based on incorrect facts. A left-leaning think tank says it has discovered dozens of what it calls "unauthorized dams" in northeast B.C. The claims are part of a report published by the Canadian Centre for Policy Alternatives Wednesday morning. "Typically, companies that would be building dams ... would first be applying for water licenses, and then be submitting the dam building plans, as required, to dam safety officials," said report author Ben Parfitt. 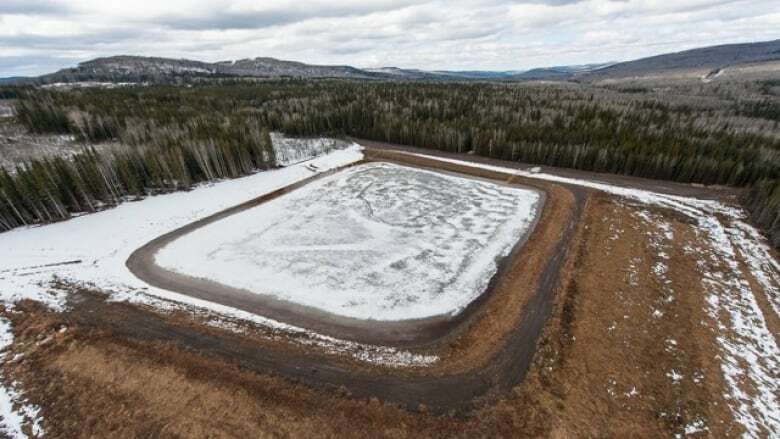 As an example, he points to two dams built by Progress Energy sometime between 2012 and 2014 that he believes should have been reviewed by the province. "These [structures are] over 15 metres in height ... or roughly higher than a five-storey apartment building," Parfitt told CBC News. "[And] considerably after the fact, are now before the provincial environmental assessment office for reviews." The dams are built so that companies can store water to be used in fracking operations. According to a B.C. Oil and Gas Commission report, one dam operated by Progress Energy was ordered de-watered sometime between April 1, 2016 and June 30, 2016 because of safety concerns. The quarterly report noted that the company was to "remove excess water from storage structure, and submit engineering assessment and certification of structural integrity." The company complied and shut down the dam. In an emailed statement, Progress Energy spokesperson Dave Sterna said the company did nothing wrong. "In fact we have been responding to legislative changes to existing fresh water dams and the authorization required to draw water from them — a situation affecting all industry participants." Sterna also says it applied for water licenses for 13 of its dams because of changes to the Water Sustainability Act. He confirms Progress Energy built 29 small-scale dams prior to 2016 — all within the confines of the law. Sterna believes the CCPA report is based on incorrect facts. "Senior dam safety officials and water officials that I spoke with confirmed that we can expect many more such applications in the weeks and months ahead," Parfitt said. The Ministry of Environment and the B.C. Oil and Gas Commission declined interview requests. In a written statement, a spokesperson said the province could only respond on "matters of environmental health, public health and emergencies ... none apply in this case." Wil Fundal is an award winning News and Current Affairs multimedia journalist in northern B.C. When he's not digging into a story, he sings as a tenor, and participates in community theatre productions.